UCD Swim Team had an impressive opening night at the Irish Short Course Swimming Championships in Lisburn collecting five titles and breaking the 400m Medley Relay Irish Club Record. Jane Roberts was the first UCD Gold medalist when she won a thrilling 50m Backstroke Final, Roberts held off Larne’s Danielle Hill (29.24) and Sundays Well Issie Hayes (29.40), to claim Gold in 29.16 seconds. Just minutes later team mate Darragh Green also collected Gold. The 20 year old student won the 50m Breaststroke Final in 28.70 seconds ahead of Limerick’s Alan Corby (29.46). UCD continued their winning role with Gold for Shani Stallard in the 200m Individual Medley. Stallard touched the wall ahead of Claremorris’ Niamh Kilgallen (2:19.06) and Antoinette Neamt (2:19.43) to win the club’s third gold medal of the night. UCD’s fourth Gold came in the 100m Individual Medley with David Prendergast winning in 55.91 seconds. Longford’s Gerry Quinn won Silver in 56.50 while Limerick’s Alan Corby was back on the podium for Bronze in 56.88. In the night’s final event, UCD claimed their fifth Gold as David Prendergast, Darragh Greene, Jack Keogh and Alex Melennec combined for a new Irish Senior Club Record in the 400m Medley Relay. The quartet set a new time of 3:46.12 smashing Trojan Swim Clubs 2002 record of 3:48.10. Antoinette Neamt kicked off the first Finals session when she cruised to victory in the 800m Freestyle. The 14 year old Tallaght and Swim Ireland NAC Performance Centre swimmer held a commanding lead to win by over 15 seconds in 8 minutes 40.52 seconds. Portmarnock’s Therese Corry was second in 8:56.14. In an exciting 50m Freestyle Final, Calum Bain of Cookstown got the touch just ahead of Curtis Coulter (23.04) in 22.96 seconds with UCD’s David Prendergast claiming Bronze in 23.07. 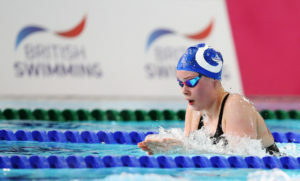 2015 European Games team member Mona McSharry collected the first Breaststroke title of the weekend in the 100m event. The 15 year old held off Aer Lingus’ Aisling Haughey (1:09.32) to win in 1:07.75. Conor Ferguson (Larne) claimed his first title of the weekend in the 200m Backstroke Final. 16 year old Ferguson was just off his Irish senior record in the final touching in 1:58.30 while Trojan’s Ben Griffin was second in 2:01.58. In the 200m Butterfly Final, Sarah Kelly of Claremorris came home in 2:15.03 with European Youth Olympics Silver medallist Ellen Walshe of Templeogue second in 2:15.88. Conor Brines (Larne) won the men’s 100m Butterfly in a time of 53.92 seconds, he beat James Brown (55.83) and Benjamin Doyle (56.22). Andrew Meegan held off Bernard Cahill as he closed in on the final length of the 400m Freestyle Final. Aer Lingus’ Meegan put in an impressive performance to beat 2014 champion Cahill clocking 3:52.39 with Cahill right behind in 3:52.84. 15 year old Jack McMillan was third in 3:56.39. In the 100m Freestyle, Ards’ Bethany Firth picked up Gold in 56.17 seconds, touching second was Lisburn’s Rachel Bethel (56.55) with Niamh Kilgallen (56.64) third. Firth was back in the pool minutes later as she lead her Ards Relay team to victory in the 400m Medley event. She combined with Zoe Thompson, Emma Reid and Mary Kate McDowell to take Gold in 4 minutes 17.57 seconds ahead of Aer Lingus (4:27.36) and Larne (4:32.25). Competition continues tomorrow to Sunday.